This sunset view was taken from Skull Creek at Hilton Head Island over the Calibogue Sound. The Sound is a section of the federally controlled Atlantic Intracoastal Waterway. The Waterway extends some 1,400 miles from Miami, Florida, to Norfolk, Virginia. This entry was posted in Atlantic Intracoastal Waterway, Florida Coast Line Canal and Transportation Company, Florida East Coast Railway, Hilton Head Island, Miami, Steamboats, Transportation history, Uncategorized, Waterway History on May 26, 2014 by Florida's Big Dig. This entry was posted in Atlantic Intracoastal Waterway, Florida Coast Line Canal and Transportation Company, Florida East Coast Railway, Hilton Head Island, Miami, Steamboats, Transportation history, Uncategorized, Waterway History and tagged Calibogue Sound, Hilton Head Island, Skull Creek on May 26, 2014 by Florida's Big Dig. The listing of tolls to travel along what would become the Intracoastal Waterway between several points along the privately owned Florida East Coast Canal in 1911. During its long history, the “Swan” would carry freight and passengers, and often, passengers and their automobiles. Freight included large cargoes of citrus fruit and pineapples in the late 1890’s. A toll charge of $1 equalled one day’s wages for the average laborer at that time. Courtesy, Rollins College, Winter Park, Fla.
One of the older steamboats plying the waters of what was then called the Florida East Coast Canal, the “Courtney” carried mostly passengers on short trips along the Florida East Coast in the 1890’s. Henry Flagler, then president of both the Florida East Coast Railway and the Florida canal company, cruised into Miami on the “Courtney” (also called the “Sweeney”) just before he arrived in Miami in one of his FEC Railway cars on April 13, 1896. Upon completion of the railway,Flagler liquidated his holdings in the Florida canal company and resigned as president. For the next thirty years, the Florida canal company and Flagler’s Florida East Coast Railway would compete for passengers and freight in providing transportation down the east coast of Florida. And both companies would compete for settlers buying the millions of acres of state land the Florida legislature promised these two companies for extending transportation into the southern tip of the Florida peninsula. 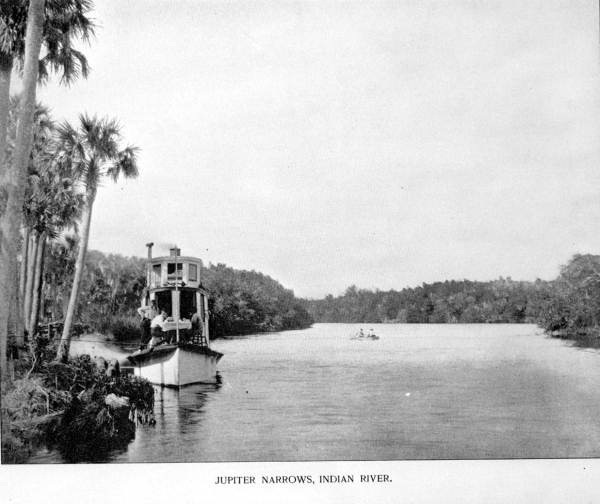 A narrow steamer carrying tourists in the Jupiter Narrows section of what was then called the Florida East Coast Canal (now, Intracoastal Waterway), as the Indian River narrowed down into Lake Worth. In some stretches of the Narrows, steamers of ordinary width stopped and started their way through a brush-lined privately owned tollway in the early 1900s. Courtesy, State Archives of Florida, Tallahassee, Fla. This entry was posted in Atlantic Intracoastal Waterway, Florida, Florida Coast Line Canal and Transportation Company, Florida East Coast Canal, Florida history, Jupiter, Steamboats, Titusville, Uncategorized, Waterway History and tagged Jupiter Narrows, Steamboats, Tolls, Waterway history on September 2, 2013 by Florida's Big Dig.